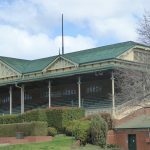 The vintage grandstand at Bendigo Racecourse is the reason this venue made it to Vintage Victoria but there are other vintage bits dotted round this beautiful country Victoria racetrack. 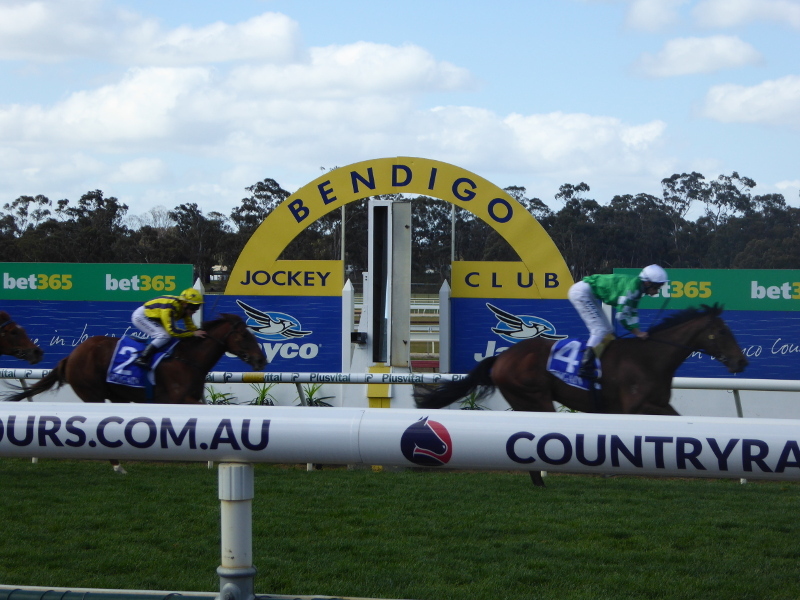 I took a day off work to go to Bendigo Races for a midweek meet in mid-September. Spring was in the air but it was still that time of year when you tend to seek out the sun rather than run for the shade. When I got a map out to find out where the racecourse was in relation to the town centre, I discovered that the two neighbouring suburbs are called Epsom and Ascot. Racing fans will know that these are two of the most famous racecourses in England, so it is no coincidence, I think. This is one of those large expansive settings, with gum trees lining the far side, but that same far side so far away that the wooded area is actually barely noticeable. There’s quite a cosy, intimate feel, though, to the area you can mill around in to watch the horses. 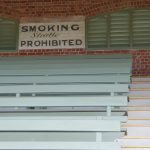 Being a lover of vintage things, I sat in the old grandstand – built in 1902 and thankfully still in place today, though further from the finish line than more modern stands, so virtually empty when I was there. 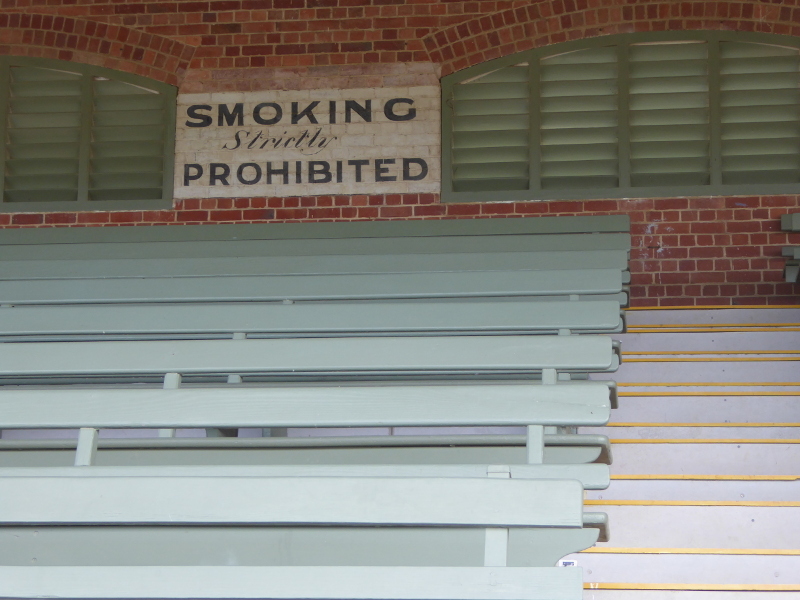 I was drawn to the ‘Smoking strictly prohibited’ signs, which looked pretty vintage themselves, and no doubt dated from an era before the general ban on smoking in public places, and there’s always more earthiness to a wooden bench than any modern-day plastic seat you’d normally find in such places in the 21st century. 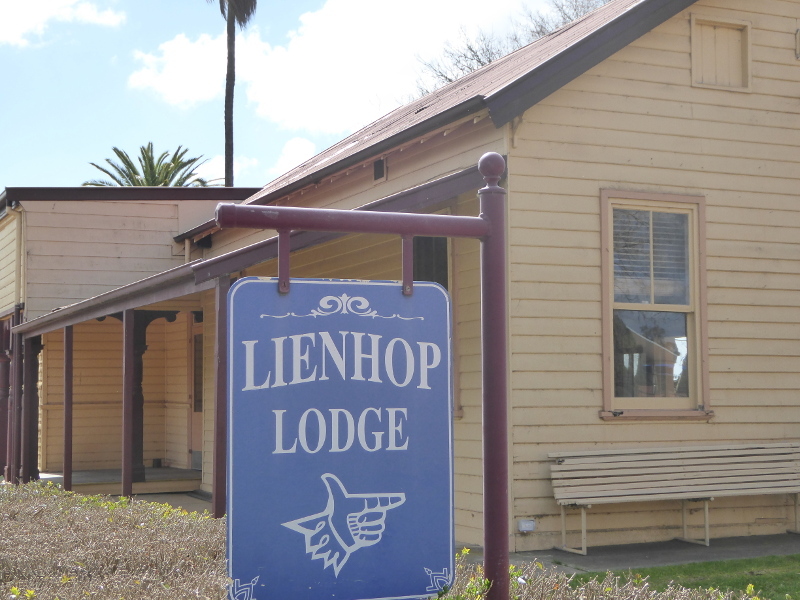 An even older building just behind the grandstand is the Lienhop Lodge, which was built in 1899. Closed the day I was at the course, but the prettiest building at the track, and bordered with a dozen or so palm trees, which add to its tropical, colonial feel. 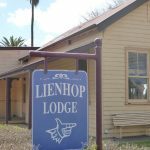 (It also got me looking up who Lienhop was, and I learnt that he was not only a former MP for the area and a ‘grazier’, but that he had been posted to London later in life to act as governor general for Victoria – nice job, I must say, and having just watched the TV drama series The Crown, he picked a pretty good time to be in London, since his stint there coincided with Churchill’s last days as PM and the coronation of QEII). 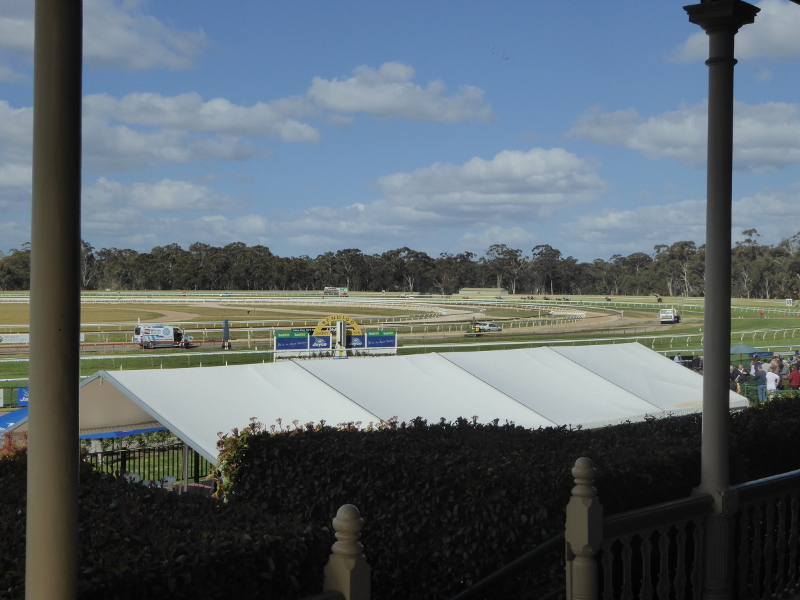 I liked the fact that there are so many benches dotted around Bendigo Racecourse. 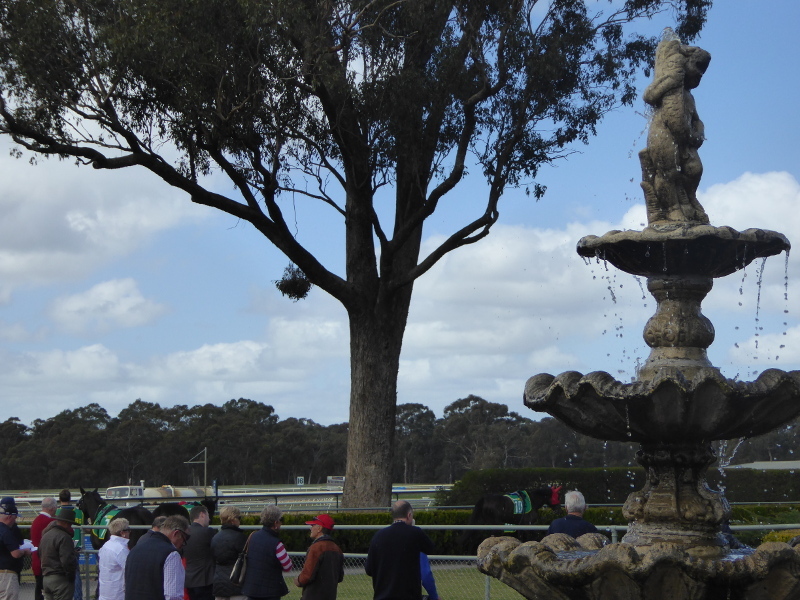 On a quiet day like this one, you had lots of choice of sun or shade, and of quiet discreet spots or sharing with other racegoers. There were not a lot of historical markers at the course. You’ll learn more about the place from my History section below than you will from anything on the course itself. 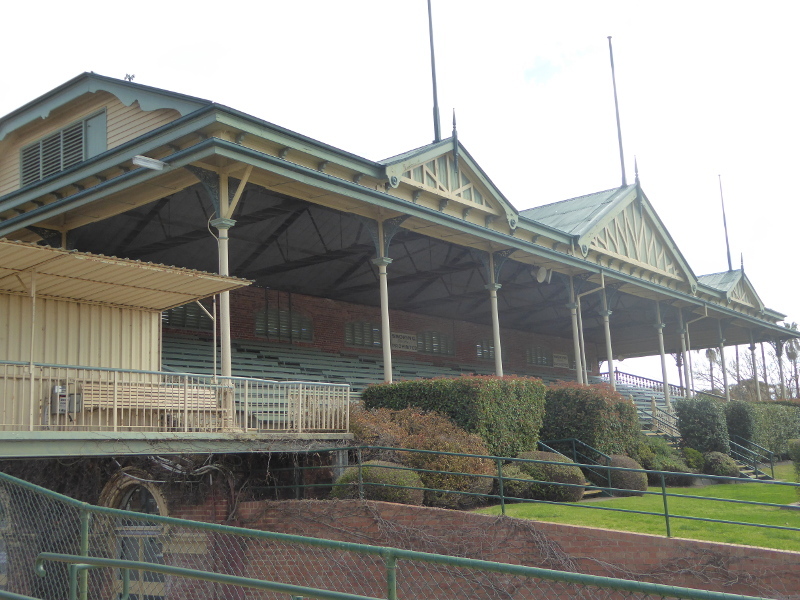 But they do recall the army camps here during the two world wars, and sitting in the grandstand, I could just picture the scene when the place was filled with armed forces personnel and equipment. I could also picture the early aviators, doing their stunts here before even WW1, but no memorial for those guys, sadly. 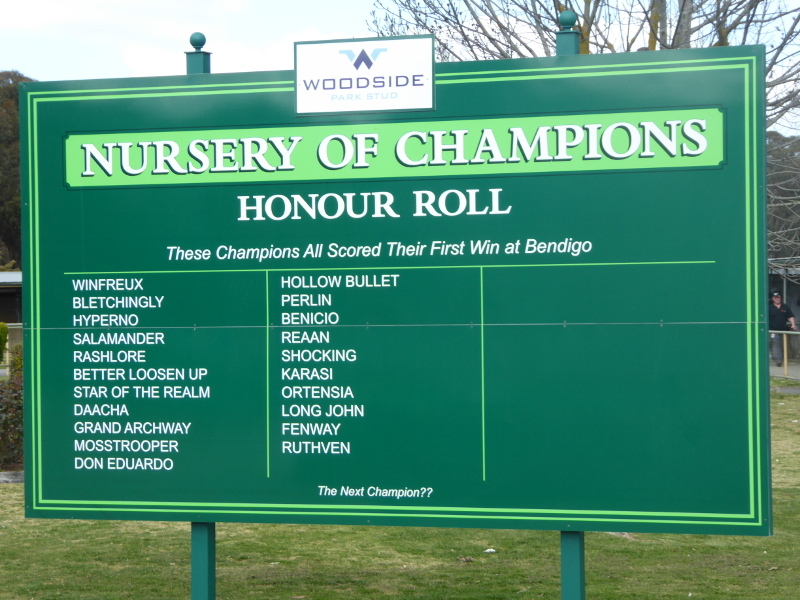 I did like the Honour Roll board not far from the parade ring, which lists champion horses which began their winning careers at Bendigo Racecourse. A nice idea other courses could copy, I think. 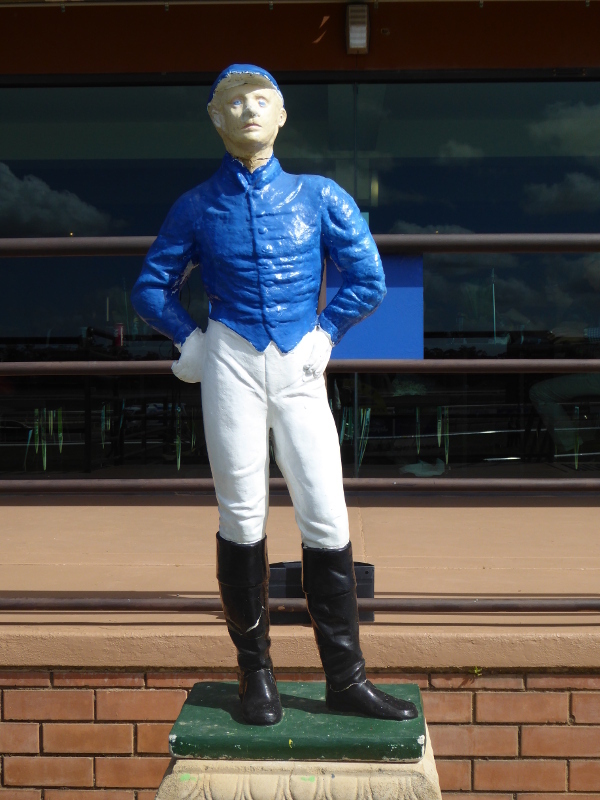 The little plaster model of a jockey drew my eye as he stands in front of the Silks Bar, though on closer inspection, he didn’t actually look of any great quality, either artistically or in terms of materials used. And how was the racing? Nice. I didn’t win (what’s new? ), but I was pleased to see Michelle Payne in person after her horse came second in one race; and there was a close finish in another race where the top six horses were barely covered by half a length (sadly mine was 6th!). No charge on a midweek meet day in early spring. 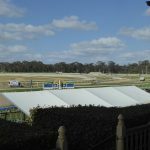 They even covered up the usual entrance fee so there’s no way of knowing what you pay to go to the races on Bendigo Cup day, for example. 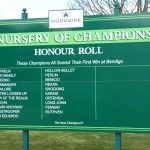 There’s good signage from the main highway to the turnoff for the racecourse and once you’re there, also clear indications of where to go if you are a member of the public rather than a ‘connection’ in the industry. By the way, the latter car park was much fuller on my raceday than the public section, but that probably isn’t the case for big race days. 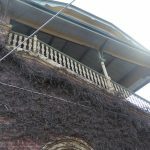 Things had moved on by March 1872, when according to the Bendigo Advertiser, the attendance was not great (at around 800 a good deal better than the day I was here), but the reporter put that down to ‘boisterous weather’, which ‘kicked up the dust to the injury of dress and the total destruction of all personal comfort’. 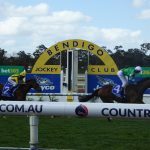 But those who braved the conditions were treated to ‘one of the most magnificent races that ever was run on the Bendigo course’: a dead heat between a horse called Lionel, and The Native. 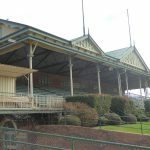 By 1897, memories were growing dim on the origins of the racecourse and the now defunct Bendigo Independent held a discussion on just when racing had begun in Bendigo, and where. 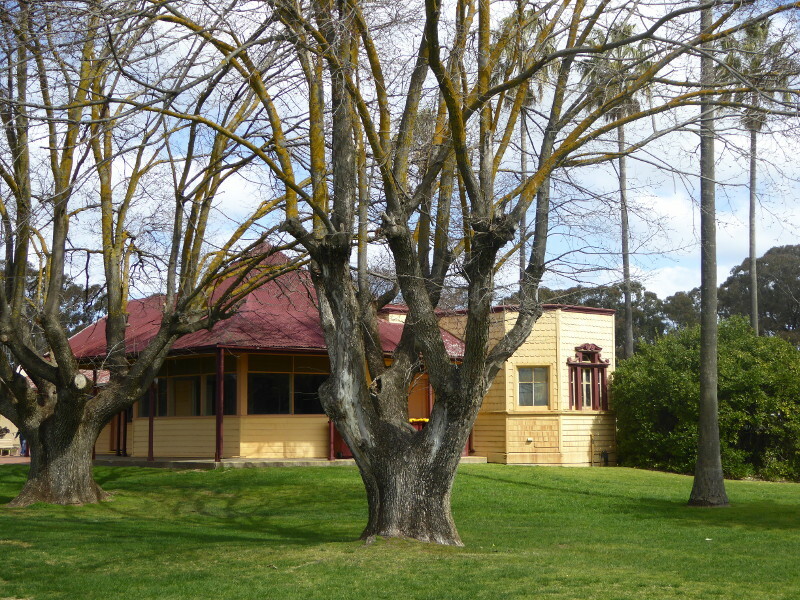 A guy called Mr P Deehan of Eaglehawk was said to have cleared the track of bush and scrub prior to the course opening at Epsom in 1854. The Deehan brothers were in those days apparently quite the local horse owners. 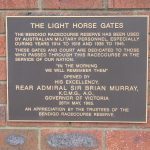 Racing continued at Bendigo for the early months of the first world war, but by 1915 when it became clear it wouldn’t all be over by Christmas, the racecourse had been taken over as a military training camp.That didn’t last too long, either, though, as a meningitis scare saw the camp moved elsewhere by 1916. 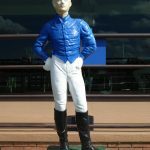 I also liked the 1956 story of the ‘Girls who want to be ‘jockeys’’ – “Two pretty Bendigo teenagers, blonde and lithe Coral Lynas, 16, and 15year old school girl Dorothy Monti, wish the ban on women riding track work would be lifted at Bendigo racecourse…”, as it was already in metropolitan Melbourne…What ever happened to those two, and being born around 1940, are they still going strong today? I’d love to know what came of their ‘campaign’…Wouldn’t it be great if Michelle Payne knows them? Maurice Guillaux – pre World War 1 aviation ace. He was a Frenchman who came to Australia for seven months before the war. In July 1914 he took three days to make Australia’s first postal delivery by air from Melbourne to Sydney. 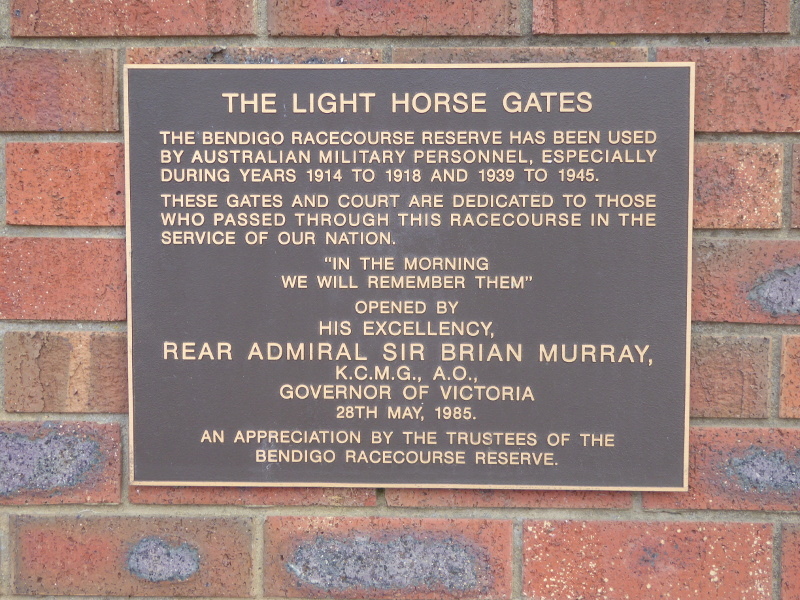 And as part of his warm-up for the feat, he flew from Bendigo to Ballarat in June 1914, and preceded that one hour flight with a display of loop-the-loops and ‘swoops earthward after the manner of the eagle’ at the Bendigo racecourse. 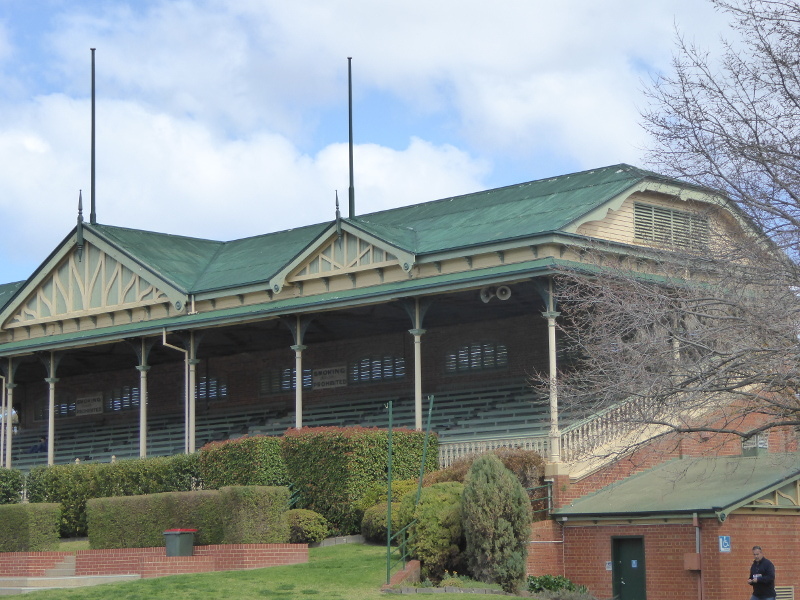 The Sydney Morning Herald of 10 June 1914 reported that he left Bendigo Racecourse at 10.25am and reached Ballarat 55 minutes later, so a little bit faster than a road trip today in 2018! 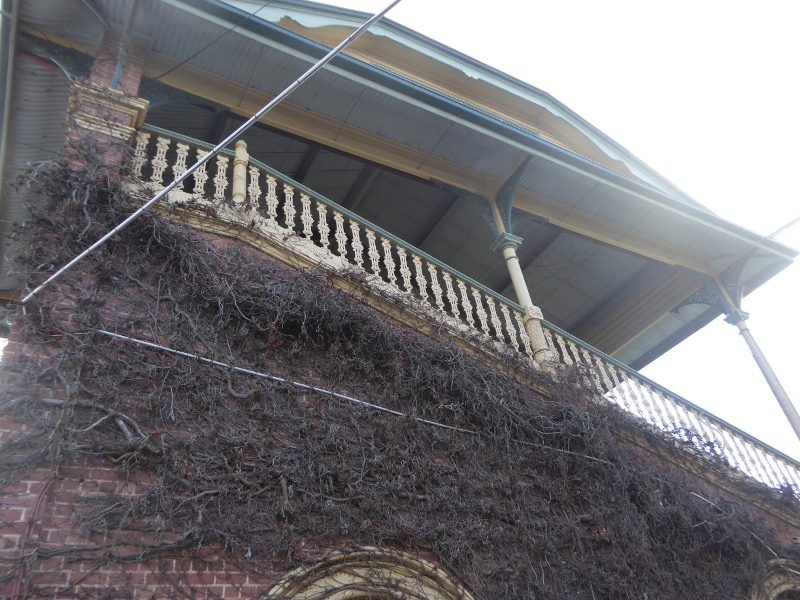 Over Castlemaine, his thermometer showed 36 below freezing so he had to drop a few thousand feet to stay warm! But the SMH has this as Australia’s first ever airmail delivery (a message from Bendigo’s mayor to his Ballarat counterpart), in contrast to Wikipedia which has the Melbourne-Sydney run in July as the first airmail delivery. Sadly, he died during WW1 while testing new types of aircraft in France. A more local aviator, Basil Watson, also wowed the crowds at Bendigo Racecourse after the army left in 1916. Even more sadly than Guillaux, he too died a year later at the tender age of 23, but in Port Phillip Bay, also in a plane crash. Flying was a hazardous activity in those pioneering days, and racecourses were often a chosen venue for flying displays and stunts by people like Watson and Guillaux. 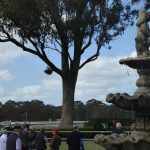 What are your experiences and stories from a day at Bendigo Races? Anybody got nice memories of days out sitting in the old vintage grandstand or even attending some event in Lienhop Lodge? What’s it like inside? Can anybody put me in touch the ladies who were called Coral Lynas or Dorothy Monti in 1956? It’d be great to interview them on the changes in women and racing in the last 62 years. 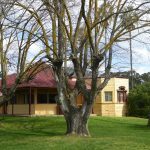 This heritage study gives lots of historical information on Bendigo Racecourse for those who want more detail. Coffee before the off or tea to drown your losses? Best coffee in Bendigo? Well, I like Brewhouse Roasters, but if you are on your way to the races from the south and driving through Bendigo on the McIvor Highway, don’t miss Atomic Coffee, which is a small hole-in-the-wall style coffee shop with a 10 minute parking bay in front just past the magistrates court on your left as you drive northwards. Great coffee and cinnamon buns to die for.